I was deeply struck by Pope Benedict's visit on Thursday to the Cardinal Paul Emile Leger Centre, a treatment facility for those suffering from chronic diseases and injuries. 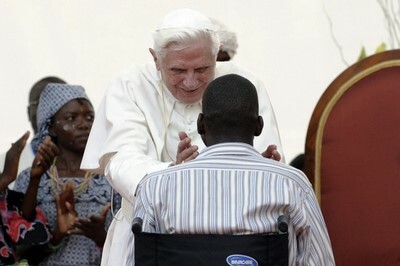 Cardinal Legereseved as Archbishop of Montreal from 1950-1968, and despite the many schools named after him in Quebec his name might be even more famous in Cameroon, where he faithfully served lepers and handicapped children for more than a decade following his retirement. Can it not be said every African is in some sense is a member of the family of Simon of Cyrene? Every African who suffers, indeed every person who suffers, helps Christ to carry his Cross and climbs with him the path to Golgotha in order one day to rise again with him. When we see the infamy to which Jesus was subjected, when we contemplate his face on the Cross, when we recognize his appalling suffering, we can glimpse, through faith, the radiant face of the Risen Lord who tells us that suffering and sickness will not have the last word in our human lives. I pray, dear brothers and sisters, that you will be able to recognize yourselves in “Simon of Cyrene”. I pray, dear brothers and sisters who are sick, that many of you will encounter a Simon at your bedside. As the secular media continues to focus on the Pope's comments reaffirming the Church's opposition to condoms what gets lost along the way are these truly meaningful and inspirational messages to many different groups. This particular address highlights perfectly the real mission of the Holy Father in Africa, to call Africans to solidarity with Christ and in doing so to inspire them to help their brothers and sisters carry their crosses. Now, that is an idea with transformative power.